This flight included two groups, which accounted for perhaps 75% of the Economy count. 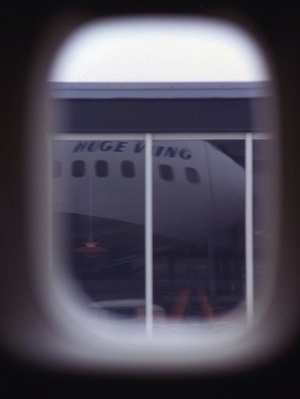 One of the groups was en route to Bergen and rerouted via Oslo due to an equipment substitution on an earlier flight. The result was a fairly demanding group of passengers, and the crew was kept busy during the entire flight (7:04 duration). Boarding was routine, except for a few extra frustrations with excessive cabin baggage. Departure from the gate was about 10 minutes late. The cabin crew attitude was extremely good. A general air of friendliness and a desire to be of service prevailed at all times. At least one cabin attendant was visible in the cabin all night long, and a good number of passengers requested drinks continuously from takeoff until the snack was offered, six hours out of JFK. A bar service was commenced prior to dinner, utilizing one cart initially (moving aft to forward), with the First Class cart brought back shortly after the service commenced and working forward to aft until meeting the Economy cart. At that point, both carts were moved to their respective ends of the cabin and a second, and later a third pass was made. Fifths of liquor were used on the FICL cart, and how the sales were verified remains a mystery. SAS uses a seating diagram, and C/As “tally” the drinks as served. Then the money is collected at the end of the flight. This procedure would make verification of amounts used from each cart difficult. Adding to the dilemma, one stewardess working the forward cart kept count on a piece of stationery, and then gave the information to the stewardess working the aft cart. She, in turn, added these amounts to her diagram, which served as the master chart. Only by subtracting the value of miniatures used could one get an estimate of how much was sold from the fifth cart. At any rate, this whole situation did not seem to bother the cabin attendants, and it certainly did not detract from the service; in fact, it speeded it up considerably. I was not surprised, however, when I paid my “bar bill” and was charged for one less drink than I consumed. I mentioned it to the stewardess, and she said “no problem,” without collecting the additional money. When serving mixed drinks, miniatures of liquors were poured by the C/A working the cart, and then served to the passenger, at which time mix was added – a nice touch. Meal trays were served immediately following the last pass of the liquor carts, in rapid order. At this point five C/As were assisting, and 132 passengers received their trays in ten minutes! Wine, champagne and beer were offered as the trays were placed, and sales were heavy. Coffee and tea was offered from silver servers, with C/As serving cream (bulk) and sugar (individual) from a matching silver service and tray. At one point, four C/As were simultaneously serving coffee or tea. A few additional cocktail orders were filled during the meal service. C/As seemed to take the additional strain readily, and willingly; I never saw an indication of any kind that a C/A felt overworked, strained, or otherwise bothered. The last meal tray was picked up approximately 2 hours, 10 minutes after takeoff, a very satisfactory length of time for a dinner service. Crew coordination was largely responsible for this; five C/As were picking up trays most of the ·time. And although the Purser was obviously “in charge” of the crew, I did not notice any issuance of directions to his stewardesses or stewards. They had obviously been trained to function as a team, and it seemed to come as second nature to them. It would have been impossible to count the number of time-saving procedures they effectively used. Announcements by the captain were interesting and timely. Eastbound, he gave it in English and Swedish. Westbound, it was in English, Swedish and Danish as well. 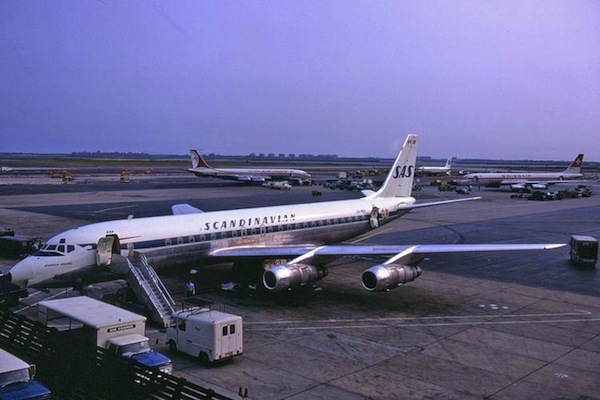 An interesting note: announcements were given first in the language of the country departed from; out of JFK, English was first, while returning from CPH, Danish came first. Following the dinner service, lights were turned down, and blankets and pillows were offered. All blankets were individually sealed in poly bags, and the purser said that only freshly cleaned blankets are provisioned at the origination of each flight. This feature certainly was impressive, although no doubt very expensive, and somewhat unnecessary, I thought. The snack service was served 1-1/2 hours prior to arrival, and was preceded by a hot scented towel service. Snack trays went out quickly, with C/As carrying six at a time. Again, five C/As were on hand for this service. Orange juice was poured by two C/As, from pitchers, and glasses were refilled twice. The other three C/As poured coffee and tea, with two more joining them upon depletion of the orange juice. Tray pickup was completed 35 minutes prior to landing. -Bar set up on serving table, directly forward of staircase (same location as our conversation lounge). Fifths of liquor utilized. Mix added at each passenger’s seat, from cans. Additional coffee/tea offered, and gradual pickup initiated where possible. -Choice of cocktails, beer and soft drinks. Beer served in plastic souvenir “meathead” glasses (draft beer, from a small foreign-made tapper keg). With five C/As and only 10 passengers I’m sure the service couldn’t be too bad on any airline. However, the meticulous personalization had to leave its added impression on everyone. 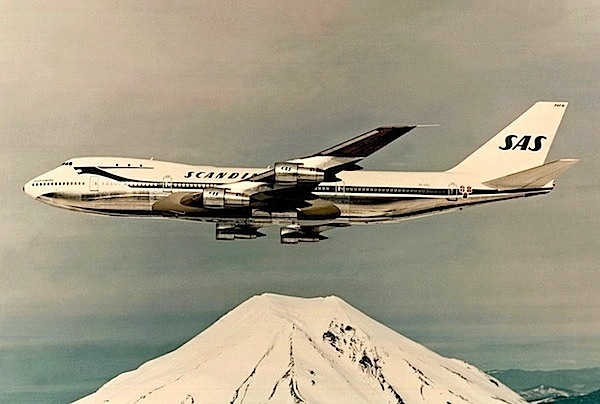 An advertisement in the “Scandinavian Times” magazine states that Pursers assigned to the 747 have undergone a six-month training course, and I believe it. 1. Individual explanation of the route of flight by the Maître de Cabine, including display of a specially prepared route map. 2. Placement of minimal amounts of silverware on tables initially, and subsequent adding of items, course by course. 3. A “thank you” offered by the C/A each time any item was placed before the passenger. 4. Adding mix to cocktails at the passenger’s seat. 5. Passengers individually asked if they desired cologne on their hot towels, and subsequent adding of it. 6. Wine and champagne bottles properly displayed to the passenger before pouring; bottles were never totally emptied into a glass. Lavatory amenities included: after-shave lotion, hand lotion and cologne (in large bottles), mouthwash, Wash N Dry-type packets, and gum massagers. Cloth hand towels were provisioned also (remember the days? ).